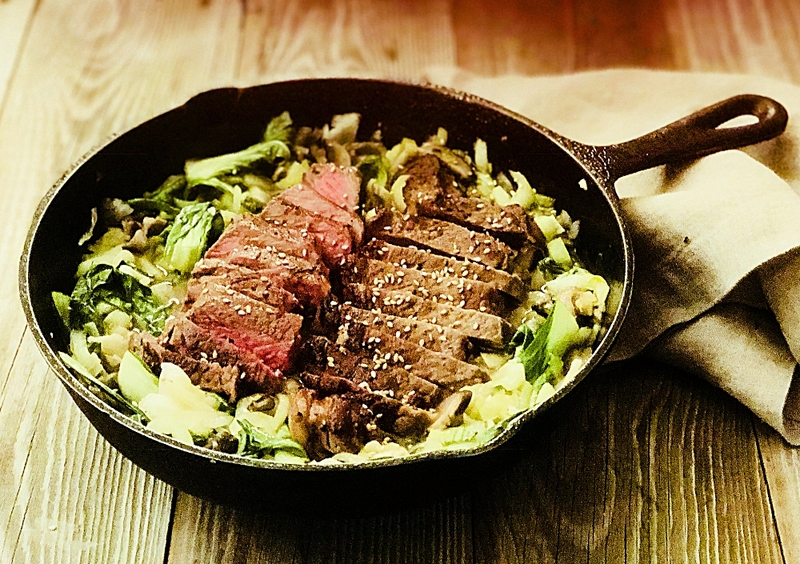 Steak and Bok Choy Asian Skillet Dinner takes the well loved stir fry concept to an easier 1 pot skillet dinner. I know I rarely post beef recipes on here and that is because we were vegan for so long that reintroducing meat has required some new skills on my part. Also, you know how much I love seafood. As it turns out you can teach an old dog new tricks. But, I am picky about the meat we buy (I know, surprise) and have started a grass-fed meat subscription with the company Butcher Box. They deliver straight to my door with all meats flash frozen. They have pastured pork, pastured chicken and grass-fed beef. 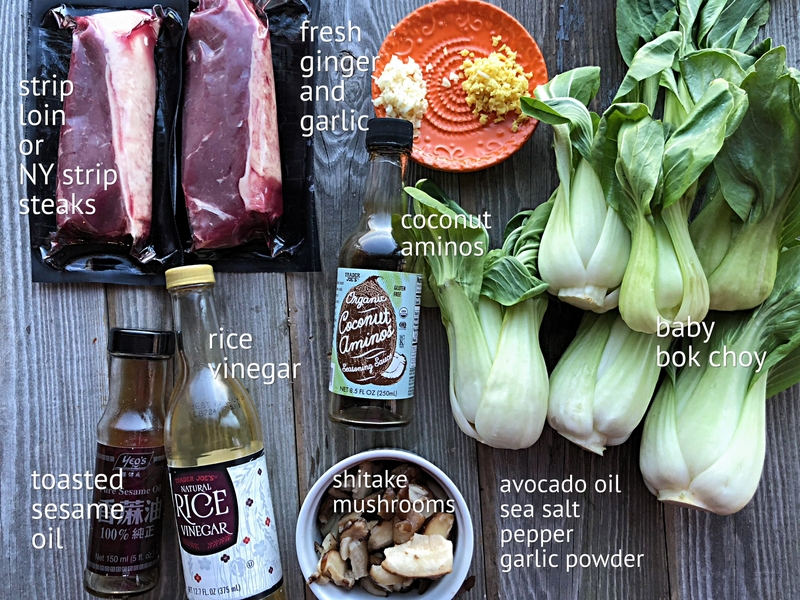 Whatever steak is used, grass-fed or conventional, this is a delicious and a simpler application of stir fry with all of the yummy Asian flavors I love and I know all my readers love too. If I’m making a recipe that requires some veggie prep for dinner that night, I like to prep the veggies in the morning, seal them up and refrigerate them until I’m ready to make dinner. This is especially true when making a stir fry or this skillet dinner because once the cooking has started, it goes quick so you want to be ready. 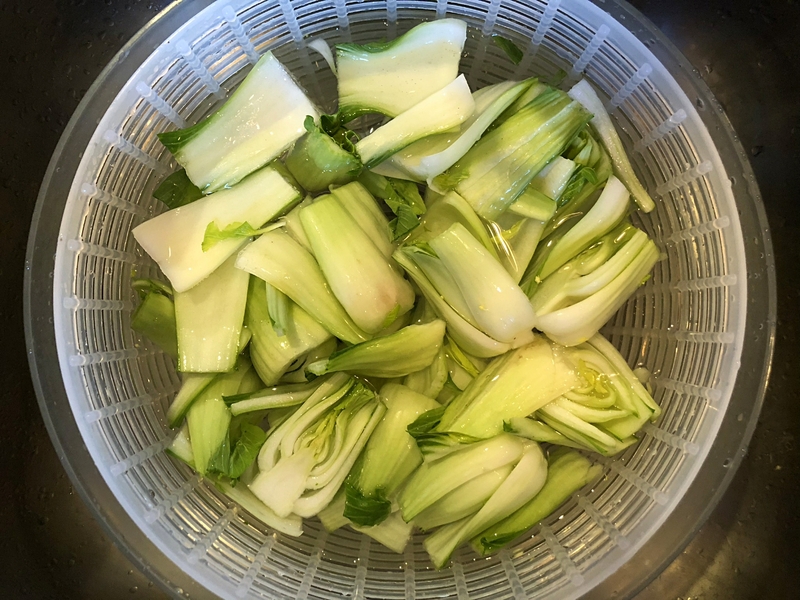 To prep the bok choy, I separate the stem from leaf because the stem takes longer to cook. Slice stems in half lengthwise and submerge in cold water to loosen the dirt that gets caught in there. Let sit 10 minutes, agitating them a bit now and then to help loosen dirt. Drain stems and slice thin. Measure out 4 cups sliced stems. If you have leftover stems, put them in a zip loc bag and place in freezer for bone broth making. I have an ongoing baggie full of vegetable trimmings for my next bone broth. Rinse leaves and set in a colander to drain. Slice the mushrooms and mince the garlic and ginger. Mix up sauce ingredients. Now you’re ready to go. Now it’s just a matter of setting up and cooking. Have all of your ingredients measured and close by and in just a few minutes this fragrant one pot meal will be at your table ready to dive into. Serve it with cooked rice or cauliflower rice, using the pan juices to flavor the rice. Option to serve it with some roasted carrots or butternut squash. I’m perfecting an awesomely delicious butternut squash fritter (recipe coming soon) to round out this menu. Please let me know how you like this…I love your input. It helps me be better at what I do and /or encourages me to keep on going. Begin by having all of your veggies prepped because this recipe goes fast and you don’t want to press pause while you chop veggies. 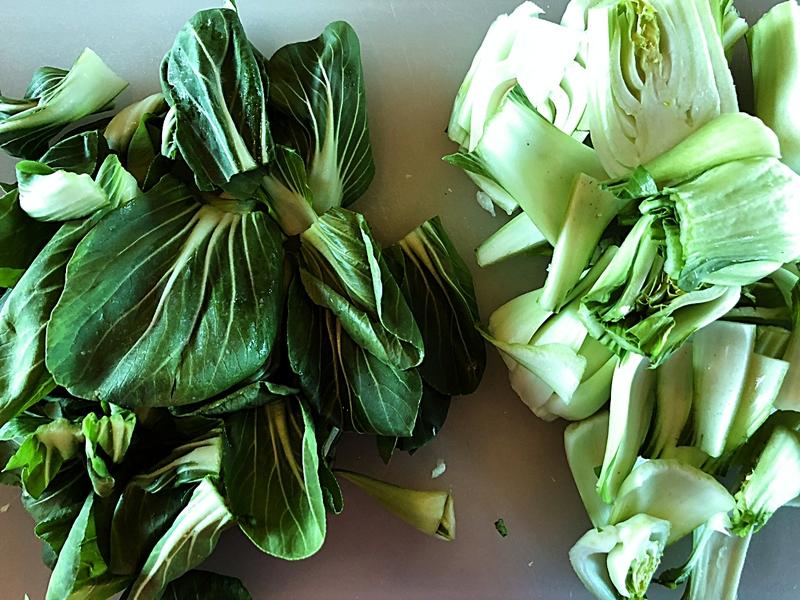 Remove stems from leaves on the baby bok choy. Slice stems in half lengthwise and submerge in cold water to loosen the dirt that gets caught in there. Let sit 10 minutes. Drain stems and slice thin. Measure out 4 cups stems. Slice the mushrooms. Finely chop ginger and garlic. Mix together sauce ingredients and set aside. Preheat a cast iron skillet on medium. While pan heats, season both sides of steaks with equal amounts of salt, pepper and garlic powder ( 1/4 teaspoon of each on each side). Rub each steak with 1/2 tablespoon avocado oil. Sear in the hot pan turning every 2 minutes, to desired doneness, about 9 to 11 minutes. Transfer steak to cutting board to rest. Pour off liquid from skillet. Heat 1 of the 2 remaining tablespoons of oil in the pan on medium-high heat. Add mushrooms and cook, stirring occasionally, until browned, about 3-4 minutes. Add 1/2 teaspoon minced garlic and 1/8 teaspoon sea salt. Continue cooking for 1 minute. Transfer mushrooms to a bowl and cover to keep warm. Keeping heat on medium high, add the last tablespoon of oil to pan. Saute remaining minced garlic and ginger and saute for 1 minute. Add the bok choy stems and a pinch of sea salt. Stir and cook stems until they wilt a bit, about 3 minutes. Add in the bok choy leaves, stirring until they wilt. Add the mushrooms. 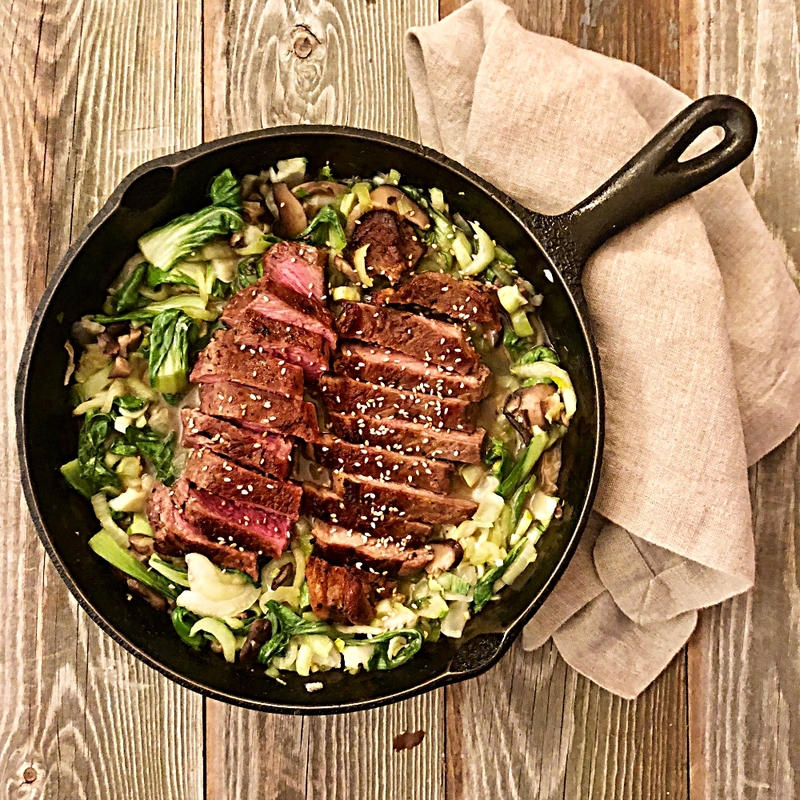 Slice steak and place on top of bok choy mix. Add sauce and bring to a simmer. Turn off heat. Sprinkle toasted white sesame seeds on top before serving. Serve with cooked rice or cauliflower rice, using the pan juices to flavor the rice.